Disclaimer: this mod has nothing to do with Aperture Science from Portal games. 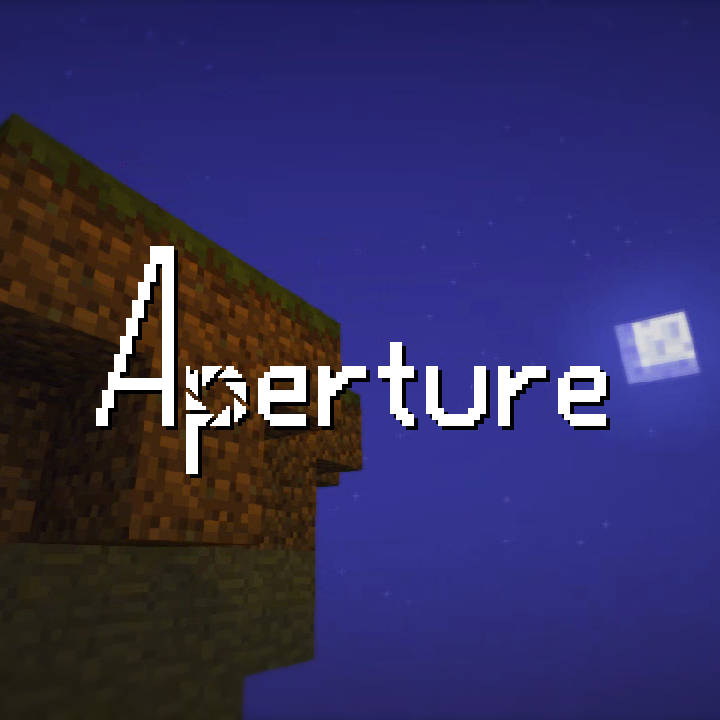 Aperture is a Minecraft mod which allows you to create advanced camera movement (for cinematics or machinimas) using camera editor GUI. It works with Forge for Minecraft 1.10.2, 1.11.2 and 1.12. Aperture mod provides a lot of features for flexible camera editing. Loadable and saveable camera profiles. You don't need to worry about losing your camera setup. With Aperture's camera profiles, you can save your camera setup on the server (if the Aperture is installed on the server) or on the client (in config/aperture/cameras folder). Duration is measured in ticks. A tick is basically an update in game's logic. Minecraft's logic loop running at 20 ticks per second. Why ticks? They're static, while frames depend on framerate, and can be easily converted into seconds (while not depending on real-time). More camera flexibility with camera modifiers. Camera modifiers are modular blocks which post-process camera fixture's output. With these modifiers, you can add camera shake, apply math equation, make a GoPro-like behavior, look at some entity while traveling a path, and much more combined. See wiki for more information. Provides a smooth camera as a Minema-friendly alternative of vanilla cinematic camera. Compatible with Minema , if want to record smooth videos on your Potato PC, install Minema mod and record smooth videos! This playlist contains a list of videos about Aperture's updates and tutorials. After that, Aperture mod should be installed and will appear in Minecraft's mods menu. If Aperture didn't appear in the mods menu, then something went wrong. Don't distort the mod name. It's the Aperture mod. You can use Aperture banner or cover for your repost page. Don't apply the watermark, though, that's just rude. Remember me McHorse? Thnx for the PC suggestions, my new one will come soon! The shaking happens when you're not in Spectator mode. When you enter the camera editor, make sure you're in Spectator mode (F3 + N to switch from Creative to Spectator and vice versa). Sorry for a very delayed response. Construction timelapses can't be made with such camera modes, you need ReplayMod for such tasks. Hello I want to use the command "look", I have to type what as selector for look an actor ? Yeah, for look camera fixture/modifier, you have to specify on which entity you want to focus on using target selectors. I usually name my actor, and then using the @e[name=entity_name] selector (where entity_name is name I gave it) in the selector field. Update the mod horsey .-. You can use 1.12 build for 1.12.2, if you didn't knew. I'm busy updating other mod, and there is nothing wrong with a mod not being updated, as long as it's stable. 1) Once - The profile would be played once, and then the view would return to the player. 2) Loop - The profile would loop until the block was unpowered. My hope is to be able to able to create an adventure/RPG like environment, but I've not yet found a camera mod that allows me to do this. They all seem to be geared towards video production, and not realtime gameplay. It would be possible to implement, but I have neither time or motivation to add such feature. I know that there most of the mods are oriented toward video production, but you might take a look at TaleCraft, maybe it provides cameras and such for RPG/adventure maps. Perfect mod! Is it real to make backport to 1.7.10, or forge can not provide some functions? Hm, I don't know, to be honest, but I'll give it a try. Ok, so I tried backporting it to 1.7.10, but forge don't have some of the most crucial hooks in 1.7.10 (it was added only in 1.8), so unfortunately, I can't bring Aperture down to 1.7.10.